Many individuals are aware of what antioxidants are, their role in cancer prevention, and fighting free radicals. That’s why, the cooking method you use to prepare foods shouldn’t be completely ignored. Properly prepared meals can dramatically improve nutrient retention and reduce the risks of many diseases. Making sure to maximize the nutrients within your food helps strengthen the immune system. There are numerous studies and publications which tell people that microwaving and deep frying can actually destroy cancer fighting elements in foods. Many also say that raw vegetables are best; however, this is not the whole truth. 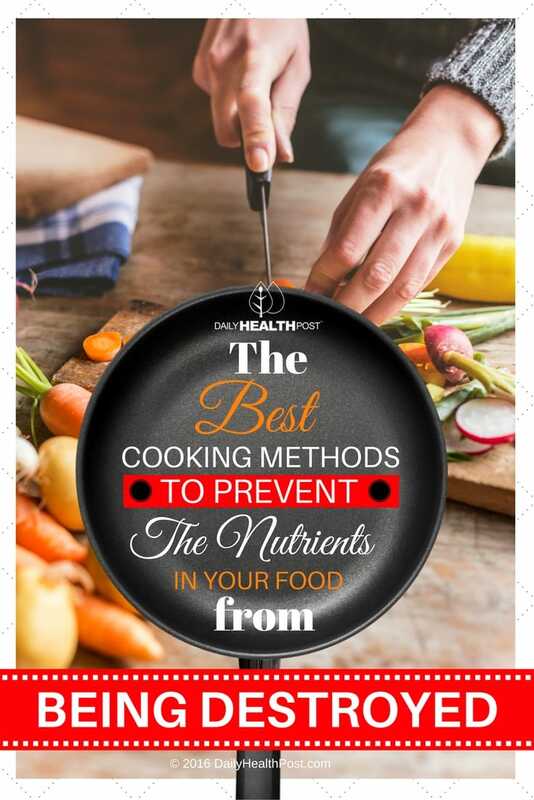 Certain cooking methods can make specific food nutrients more readily available for digestion than if they were eaten raw. The tomato is actually a fruit and not a vegetable, though many people refer to it as one. This vine fruit contains a powerful ally against several types of carcinoma, as well as cardiovascular disease, known as lycopene. The same nutrient that can be found in watermelon, lycopene is a potent antioxidant that effectively assist the body in reducing oxidative stress. The New York Times published an interesting article which cited several examples. It stated that cooking tomatoes for only a mere 2 minutes reduces their, as well as other vegetables’, vitamin C content. On the other hand, cooking tomatoes increases the readily availability of lycopene. There is some variance among experts concerning the amount of cooking time. The AICR says that consuming tomatoes which have been cooked with olive oil for about 40 minutes increases lycopene absorption up to 55%. Cruciferous vegetables contain myrosinase which is required in order to create sulforaphane. Sulforaphane has been shown to have powerful cancer destroying properties. Cruciferous vegetables include vegetables such as cabbage, kohlrabi, and broccoli to name a few. Specifically broccoli sprouts contain the greatest amount of the vitally important myrosinase enzyme. 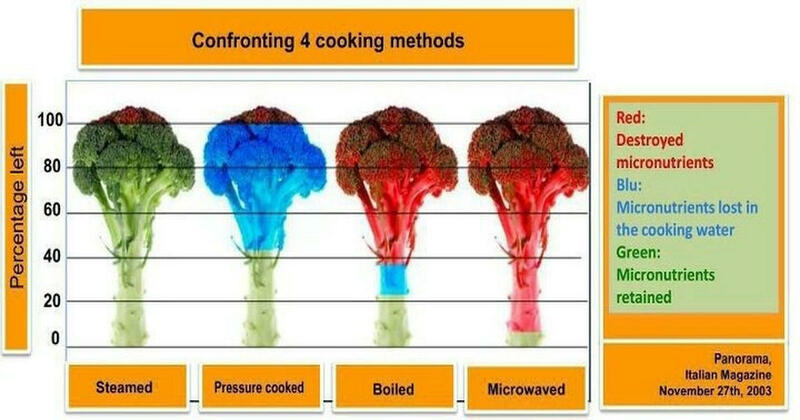 The AICR recommends steaming broccoli for no more than five minutes, which conserves myrosinase, as opposed to using a microwave or boiling it which effectively destroys the enzyme. Potatoes are the most commonly consumed food which has the potential of creating acrylamide. Acrylic amide, or acrylamide, is a water soluble chemical compound which is created through a chemical reaction by cooking foods high in starch at intense temperature. Exposure to high concentrations of acrylamide have resulted in negative health aspects in study animals including the growth of tumors. Boiling and steaming the starchy foods reduces the likelihood of the chemical reaction. Broiling, baking, and frying are much more likely to produce acrylamide. Even if the foods are exposed to lower temperatures, but for longer periods of time the chemical reaction will still result. Submerging potatoes in water for at least 15 minutes prior to preparing them can measurably reduce the formation of this chemical compound. It is also recommended that potatoes be kept in cool, dark storage, but not in the refrigerator. If this dish must be fried, it is best to do so only until the potatoes are golden, not dark brown. The FDA recommends the same for grains such as toast. Steam or bake vegetables in their skins to benefit from cancer fighting properties without losing all of their important water soluble vitamins. The AICR encourages preparing meat using low temperatures to reduce the risks of developing cancer. Numerous carcinoma preventive meal preparation tips may be found on their website. Mince garlic at least 10 minutes prior to cooking it to release the cancer fighting, antioxidative enzyme known as allicin. Use herbs and spices to add flavor to your foods and to fight cancer. Always add a bit of fat with foods high in fat-soluble vitamins, such as vitamins A, E, and K.
Add lemon or other foods high in vitamin C to vegetables that are rich in iron to help increase absorption of this important mineral. For instance, add lemons to a spinach salad.